Well-staged revival of #ROHCarmen - fresh and direct like a good West End performance. Wish I could say more. 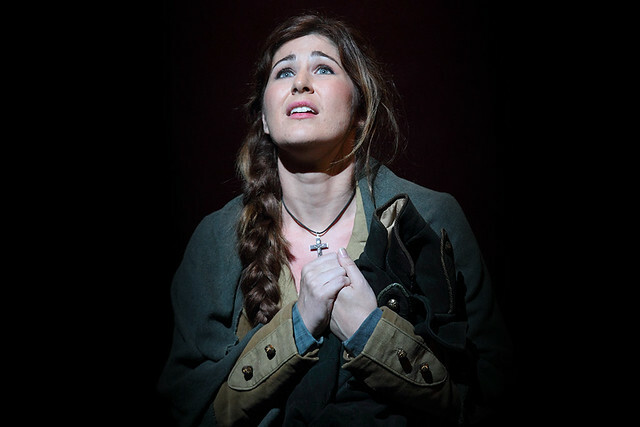 #ROHCarmen Standout performance from @NicoleCar_Opera. Her 3rd act aria the highlight of the evening. @TheRoyalOpera Enjoyed #ROHcarmen without loving any of the main performers other than the cute horse and donkey. Adequate and ok I'd say. *Excellent* @RoyalOperaHouse debut by @NicoleCar_Opera. Rest of audience seemed to agree if the applause was anything to go by! ???? What did you think of Carmen? Let us know via the comments below. Carmen runs until 30 November 2015. Tickets are still available. The production is staged with generous philanthropic support from the Royal Opera House Endowment Fund. What an operatic treat ! A fantastic production with a fantastic cast and conductor. It makes SUCH a difference to hear "Carmen " in French .Bravo to all concerned! Flashbacks to playing Bizet's Carmen in my school orchestra had always tarnished my enjoyment of this opera but any fear of overfamiliarity was swept away by this very enjoyable and engaging production. Vinogradov and Nicole Car were amazing and loved the bull fighter costumes! Who could ask for more, great voices, great set and music we all know well. Absolutely amazing. The Cast & Orchestra were superb. Set was perfect. The only down part was my hands were sore after my enthusiastic applauding at the end. I guess I'm going to have to take my Mother to see it now. It's been 24 hours since I watched Carmen on 24 Oct and I still can't recover from the thrill. What an amazing production! Congratulations to Ms Zambello and everybody who worked for this production, Ms Car was absolutely magnificent, thank you ROH for this performance. This revival has been very carefully refreshed and rehearsed: All ensemble are perfectly directed and the whole production works very well despite it is a "routine" revival. Musically and theatrically I found the principals not really at the level of what one would expect from a ROH performance - except the excellent Escamillo from Vinogradov-, but on the other hand the smaller characters were absolutely outstanding, from the excellent Nicolas Courjal (Zuniga) to the amazingly charismatic and beautifully singing Samuel Dale Johnson (Morales) and Vlada Borovko (Frasquita). Johnson and Borovko both follow the Jette Parker Program and are more than good singers, they literally shine on stage! That was quite a big surprise to me, I've never seen such brilliant interpretations of Morales and Frasquita. Going to the Royal Opera always makes for a great evening and last night was no exception. It was a colourful and exotic occasion but not really because of the stage. Some say the set captures the sultry heat of Spain. I suggest that the set and costumes were brown, minimalist and yet more brown. It reminded me of my school stage in the 1960s.Thank goodness for Escamillo's colourful torero costumes. Thank goodness, also, for Alexander Vinogradov who plays Escamillo and has a fantastic bass voice. He and Nicole Car, who plays Micaela, were a pleasure to listen to and I understood their French. I'm not sure I could understand Elena Maximova's mezzo-soprano French accent at all .But maybe I'm too strong a fan of the Brazilian Carmen Monarcha! Like, I imagine, a large proportion of the audience on Saturday night and an even larger proportion of those responsible for the scatter of empty seats, I booked this performance hoping to see Jonas Kaufmann’s Don José. 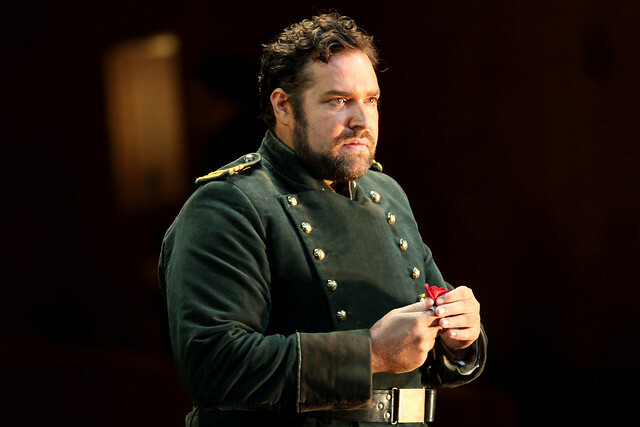 Andrea Carè is very different from Kaufmann. His interpretation was more conventional, but none the worse for this. Despite the late cast change, there was real interaction between him and Anita Rachvelishvili’s Carmen. (Or, where necessary, non-interaction: as it should, his Flower Song moved everyone in the house except the person it was addressed to.) As a bonus, Carè is the first Italian tenor I have ever heard singing intelligible French. Sonya Yoncheva impressed as Micaëla, injecting real drama into her big solo. Hers is a more powerful voice than we often hear in this part, more of a match for Carmen. The smaller roles were all done well, Samuel Dale Johnson’s Morales standing out among them. The production is wonderful to look at, too much so at times. Its hyper-realistic re-creation of the constant bustle of public spaces in Seville entails a constant danger of upstaging the principals. Children, animals, cripples, beggars, gypsies, hawkers and acrobats compete for attention, even at moments when the stage is customarily empty of all except the main singers. The chorus and extras evidently relish the opportunities afforded by these vignettes. So it is all the more extraordinary that this production cuts the first section of the final act, depriving us not just of more spectacle, but of the necessary relaxation of dramatic tension before the final confrontation. Ironically, Escamillo’s horseback entrance makes him less, not more impressive. Forced to sing the first stanza and refrain of the Toreador’s Song sitting motionless on his mount, Gabor Bretz is prevented from matching the piece’s vocal athleticism with physical swagger. From the first bars of the prelude, Alexander Joel took the score at a frenetic pace. At times, too much so for the singers, who were left struggling to keep up. I've passed your comments about our search policy back to the Front of House team. I am retired now,but for me this is the best production ever! The choice of cast and lighting etc. were superb. I hope they will put out a DVD in the future.